"In your way you will always find many challenges and problems, but also many opportunities," Juana Lisseth said. By 6th grade, she had already reached the highest level of education offered in her home town of Mesas de Acicaya, an under-resourced rural community in Northern Nicaragua. Many students in Mesas de Acicaya went directly into agriculture or informal employment after primary school. Further intellectual pursuits were seen as only available to those from the capital city or those with financial means. However, Juana Lisseth’s primary school teacher sought to change this attitude and started Juana Lisseth on her journey to leadership. Inspired by his commitment to education and resolve that any student, no matter their background, can pursue his or her dreams, Juana Lisseth moved to Boaco (approx. 40 miles away) to live with her godmother so that she could continue her education with the hope of becoming a teacher herself. She completed secondary school and soon found herself on the way to the Universidad Nacional Autónoma de Nicaragua (UNAN-Managua) with a full academic scholarship, becoming the third person from her hometown to reach higher education. In 2015, Juana Lisseth applied for the Study of the U.S. Institutes (SUSI) program with a desire to help increase educational opportunity in her community and change the mindset of young people from what she experienced firsthand. However, she did not know where to start. At the time Juana Lisseth admits that she did not know how to empower others and was shy to speak in public. All of that changed, though, with the values, skills, and ideals she learned through her SUSI program at the Institute for Training and Development (ITD) in Amherst, MA. Through SUSI, she learned how to approach social problems, engage youth and the community, empower others, and how to leverage networks. Upon her return from the U.S., with new skills at her disposal, she continued her quest to help her community. She won funding for and implemented a project she developed during her exchange program, Camino al Saber, which provides educational coaching, entrepreneurial training, and teaches leadership to youth in Mesas de Acicaya. Through Camino al Saber, Juana Lisseth has partnered with 5 other SUSI alumni to help more than 60 youth and has shown the community the value of education. As luck would have it, the timing for her initiative coincided with the opening of a secondary school program in her community, which was part of a five year campaign started by the primary school teacher who inspired her years ago. In 2016, Juana Lisseth and Fanny Mejia, also a SUSI alumna, reached out to Seeds of Learning (SOL), an American nonprofit organization, with a proposal to build a library at the public school where Camino al Saber is housed. SOL liked the proposal and is funding $18,000 for the construction of a learning center for youth in the community. A group of U.S. students from SOL and the community of Mesas de Acicaya will build this learning space together in March 2017. It will benefit both local youth and others from surrounding rural communities. 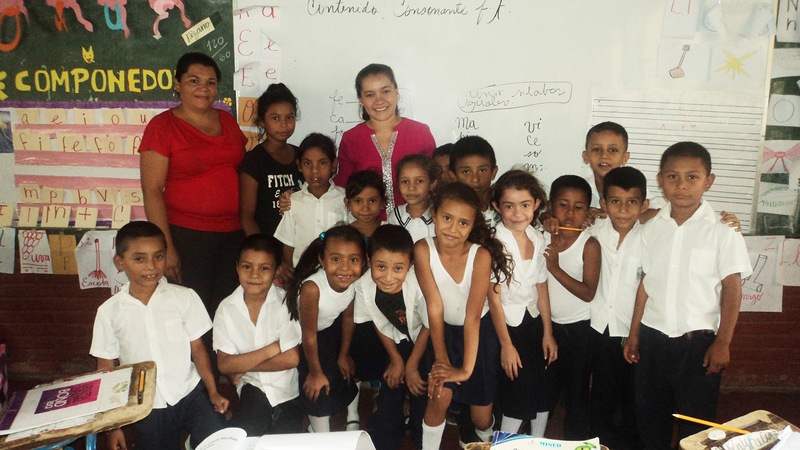 In addition to Camino al Saber, Juana Lisseth has worked to bridge the urban/rural gap that exists in Nicaragua. She used her networking skills learned through SUSI to connect with the Solid Rock Foundation (a local NGO) and persuaded them to provide scholarships for community members to travel to Managua and learn handicrafts as a way to increase economic security through entrepreneurship. Most importantly, she has demonstrated by example the positive effect youth can have in bringing a community together. In fact, youth have already organized activities such as raffles and movie screenings in the community to raise funds to cost share the upcoming learning center and are already thinking about the roles they will have when the learning center is ready. Each month, the Bureau of Educational and Cultural Affairs’ (ECA) Alumni Affairs Division, which supports alumni as they build on their exchange experiences, recognizes one outstanding alumnus or alumna. Juana Lisseth Martinez Gutierrez is this month’s outstanding alumna, and her work will be recognized throughout March on the International Exchange Alumni website, ECA’s official website which serves more than one million Department-sponsored exchange alumni worldwide.